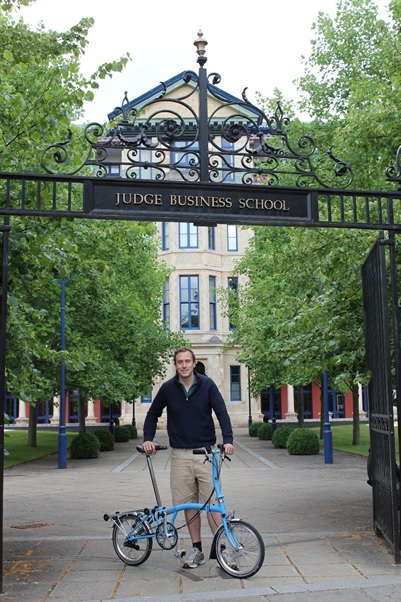 On 22nd September 2014 I will cycle a fold-up Brompton bicycle from London to Geneva. I expect the journey to be around 700 miles and should (bearing minor mishaps and misfortunes) take less than ten days. Just one issue-I don’t have much experience in long bike rides and I’m a near-awful navigator. I am doing this to raise money for the Shackleton Foundation, a charitable foundation who believes that a new generation of charismatic leaders are needed to help solve some of the most difficult problems in society. The Shackleton Foundation gives seed grants of up to £10,000 to inspirational leaders who are creating charitable ventures to help disadvantaged children at risk of falling behind. This year they are running a fundraising campaign “My Antarctic” which is looking for people to challenge themselves to do something that scares them in order to raise money for charity. This cycle to Geneva is my Antarctic. My ten minute cycle from the flat to Cambridge Judge Business School is alas a little too short to classify as a training session. I have however been able to get a few rides out around the Cambridge countryside. As you can see, being in Cambridge the year it hosted the Tour de France stage 3 has meant that there have been even more emphasis on cycling than usual. Over the next month or two I’ll be getting more miles under my belt and planning the final logistics. I’m aiming for roughly 80 miles a day and will send photos and updates along the way. The Shackleton Foundation look for people with risk-based projects that are innovative, scalable, and facilitate disadvantaged children reaching their potential. I’ve been a trustee of the charity for the past 7 and a half years and if you have a moment, and are interested in donating I’d be grateful if you could check out the following address. If you’re interested in finding out more about the Shackleton Foundation, please check out the website.